Marvel’s Inhuman has been a troubled title since before it debuted. The first issue was considerably delayed because of original writer Matt Fraction’s exit, and the title’s second and third issues were delayed further to accommodate artist Joe Madureira, a notoriously slow creator. The book’s sporadic release has impacted its momentum—which is a shame, because writer Charles Soule clearly has a passion for these characters—but it looks like Inhuman is finally settling into a more consistent shipping schedule with the debut of new series artist Ryan Stegman. Inhuman #4 sees release just two weeks after Madureira’s final issue, and Stegman’s art in the preview below shows that the series’ visual quality isn’t dipping with the creator switch. Stegman’s detailed, expressive linework is elevated by Marte Gracia’s beautifully dramatic color palette, which accentuates a sense of foreboding in the opening pages of this preview with the combination of cloudy gray and sickly green. 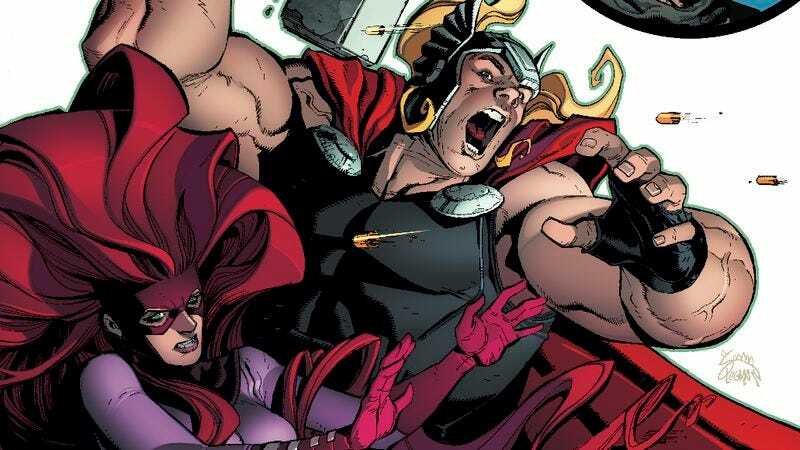 Things brighten up a bit when the action shifts to Medusa walking through New Attilan with fellow Inhuman Inferno and guest star Thor, but danger is still lurking around every corner for these characters, as evidenced by the sniper shot on this preview’s final page. The stakes continue to rise in Inhuman, and hopefully the title’s new release schedule will make it easier for readers to become more invested in the drama.